Estudio José Luis Rodríguez Gil created this net zero home in the Canary Islands back in 1995, but only recently has a series of gorgeous images of this dwelling surfaced on the web. Called "House in Bioclimatic Experimental Urbanization", the 120 square meter plywood residence was carefully designed to optimize the efficiency of its rooftop solar panels, while a basalt stone wall provides protection from the sun and wind. Long before it was fashionable to do so, the client commissioned a design that would be completely self-sufficient and produce zero carbon emissions. The turbines are crucial to this goal, as are the photovoltaic panels. Meanwhile, the carefully chosen building materials maximize energy efficiency, and interior decorating keeps brings the warmth of Spain indoors. 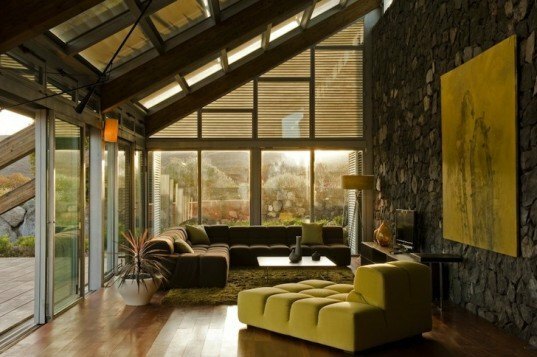 "Amazing net-zero home in the Canary Islands even has its own on-site wind turbines. More details here: http://bit.ly/1kDE3mW" What about the unberable noise made by the wind turbines. It is impossible to live near by. Exactly what i need !!!!! Called the House in Bioclimatic Experimental Urbanization, it boasts a huge menu of natural materials and clean energy sources. A stone wall provides protection against the elements. 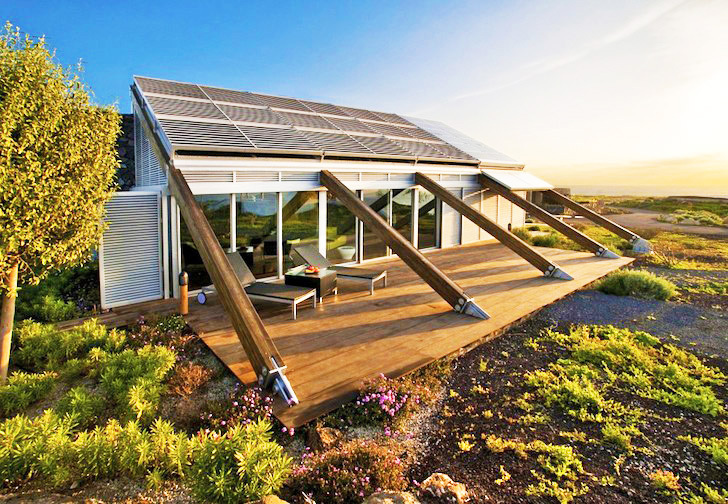 The slanted roof maximizes solar gain for the rooftop panels. On-site wind turbines also generate clean energy. The home produces zero carbon emissions. Locally-sourced materials provide excellent thermal massing, contributing to the project's energy efficiency.